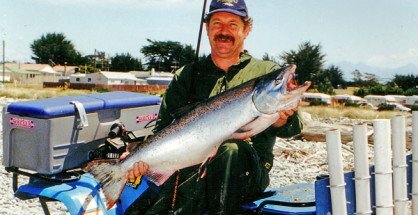 Rangitata River trout and salmon fishing category. Sea-run trout near the river mouth, and rainbows in the mid and upper reaches. Sea-run Quinnat salmon from November to 31 March. Central South Island Fish and Game region. Check your regulation booklet as the salmon season ends earlier, on 31 March, than in the neighbouring North Canterbury Fish and Game region.